After years of struggling to get the cord wrapped just right, so my Dremel would fit back into its original plastic storage case, I finally bit the bullet and designed/built my own wood storage case. I made my case from common 3/4” thick pine planed down to 1/2”. For the corner joints, I glued them with Titebond, but also screwed them together using some neat little Trim screws I discovered when I was making screens for the Marsh Park upgrade project. I also burned in the image of the Dremel tool on the top using my electric woodburning pen. To read about my Trials & Tribulations on this project, you can read my woodworking web site. On my web site, I also give a link to the Google Sketchup model in case you are interested in building a case like this. Cool case. The picture is worth a thousand words. Nice looking case. Burning the image into the top is great idea. Memory not being what it used to be having a picture helps!!! 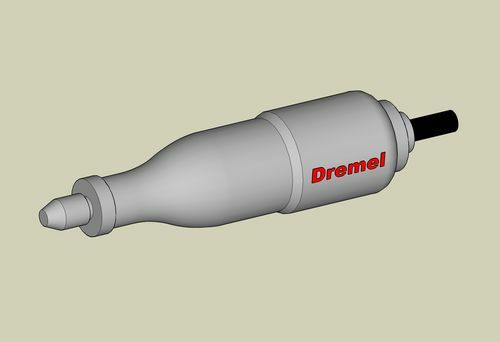 For this project, I did a Google image search to find a side view of my older Dremel….......which I found. I imported the JPG image into Sketchup, scaled it to match the actual size, then drew the Dremel in Sketchup in 3D. I drew a plane through the center of the 3D model, then intersected the 2, leaving a 2D outline that I could use for my burn pattern. This is a very nice storage case for a versatile tool and various cutters and accessories. I have a couple of these and I hope that I can scrape up the time to make a couple of these cases. 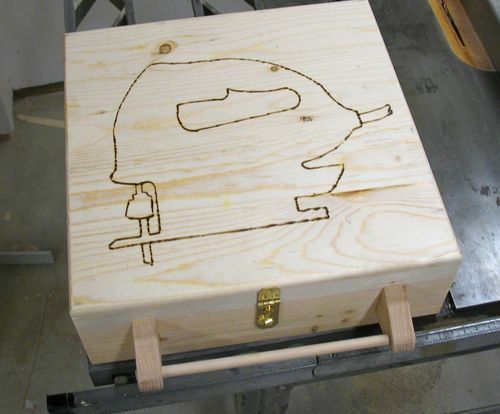 You did a nice job on this box and it is a nice addition to your shop. I agree with you. The case that comes with the Dremel is used once properly when it comes from the store because you are never going to get that Dremel and cord back into the box and shut it. I have other tools that have a similar issue, but not as bad as the Dremel as the other tools can be coaxed back into the box. Great solution and execution. I made the area that holds the bits a lot larger than the original Dremel plastic case, so they are easier to get out also. So your one of the guys that uses existing 3D models to help build projects, just like me! That is much better looking than the plastic case and probably easier to use too!